Another album in the 1968-69 series on WoNoBloG in which Wo. takes a look at albums behind the hits of his early youth, albums he never heard at the time, nor since. The hitsingles are sort of a part of his DNA, written on a blank space. In this series you can find reviews on Blood, Sweat & Tears, Donovan, Blue Cheer, The Cats and others. 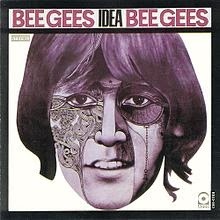 Today's turn is the second 1968 album of Bee Gees, Idea. Bee Gees were around/famous for a little over a year when I got home with my first Veronica Top 40 leaflet. The hit in that top 40 was, 'I've gotta get a message to you'. Something like the tenth hit in 15 months, including 3 #1 hits. The Beatles like proportions Bee Gees reached in NL in 1967/68. Three Australian brothers with two compatriots that had been picked up by manager/producer Robert Stigwood. In an earlier piece I wrote on Bee Gees in WoNo Magazine at the death of Robin Gibb (http://wonomagazine.blogspot.nl/2012/05/im-robin-gibb-1949-2012.html) (and on The Cats on the death of its guitarist, Cees Veerman), I wrote that I have a hard time to place this band. Who to compare it to, as they seem to be in a universe of its own? Bee Gees attracted a large audience, must have had a large fanbase at the time. From the pictures I remember they dressed as hippies, had long hair, but at the same time they looked like the older boys next door. The pop band for Christian girls? Well, the 8 year old I was certainly liked the Bee Gees, and today are sort of my guilty pleasure, combined with the sentiment of the 7, 8 and 9 year old hidden away somewhere inside that veers up every time a Bee Gees hit comes by. With the exception of 'Main course', the 1975 soul conversion album of the band, I have no album in the house, but have a lot of the 60s singles from fairs, second hand stores, etc. So what is a Bee Gees album like? Well, a lot like the singles. The songs go off in a lot of different directions, but always remain seemly. Just a hint of psychedelia, more in the slightly slurred singing than the music. Songs with a lot of orchestration behind them, but in front of that is a band. Something I did not really expect. All the instruments are played by the five band members, who next to the three Gibbs were Colin Peterson on drums and Vince Melouney on lead guitar. Next to that there is a clear influence from The Everly Brothers. 'Kitty can' has the sort of singing the two Everlys became famous with. At the same time 'Kitty can' has elements of The Who singles like 'Happy Jack' and 'I'm a boy'. A strange sounding mix, but here it is. In 1968 Bee Gees was a hit band for only one year, but already discord raged high in the band. I remember that there was another line up for the band about "once a week": a new single, a new line up it seemed to me. Robin Gibb was recording on his own. It even looks like there were two bands on this record, Robin Gibb and the rest. Melouney left the band in the fall, but not before he sang solo on his own song, 'Such a shame', an appropriate title we now know. (By the way, 'Such a shame' is a surprisingly good song, less Bee Gees more 60s pop/rock. I like this one.) Idea had been released by then and all songs for the follow up, 'Odessa' (1969) already had been recorded in the same sessions. Next to that singles were released in a stand alone fashion. I notice that it is somehow hard to form a real opinion of the songs on Idea. They are so far away from what I usually listen to and at the same time they, nearly all, sound so familiar. Of course there are two hits, 'I've gotta to get a message to you', which certainly is one of my absolute favorite Bee Gees songs and 'I started a joke', a far more elementary song, one that only has basics and stripped away all superfluous sounds. A song which is all about the vocal melody, by Robin Gibb. There's a third single that was released in 1971 or 72 in NL, 'When swallows fly'. Like recorded songs from these sessions that were released as single in 1970, two years later, at a time that maybe there wasn't even a band anymore due to the inner strive, but still loads of recorded work that could be released. The hard thing is that I can not honestly say that I truly like what I'm hearing, while at the same time I can't say I hate it. 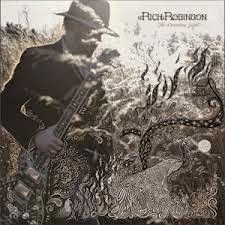 In fact this album is very well made, with craftsmanship in plain sight and these guys can sing. The piano sounds so familiar, so Bee Gees. Just listen to the opening song, 'Let there be love'. If ever there was an exemplary Bee Gees 60s song, it's this one. It has the singing, the violins, the piano. All. 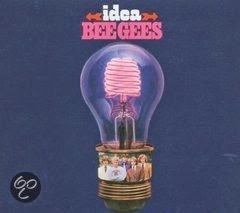 There isn't a bad song on Idea, but it is on the edge of the sort of music I prefer to listen to. So perhaps Bee Gees was the One Direction or Take That of their generation, but one with an astonishingly long career, still scoring hitsingles in the 1990s. And all with the compositions of the Gibb brothers in one constellation or other. So in the end I'll write that Idea surprised me in some ways and that I like it in the way I like nearly all the singles by the band in their first three years. At the end of the summer we had a post on The Black Marble Selection. The band played the support slot of The Kik, that night with all the blood, fainting and what not. All that happened after the support slot of a band that played 60s music with a sound that was an exact copy of music from those days and probably even the clothing was just right as well. 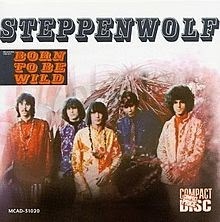 A band from just before The Beatles discovered LSD and starting acting, dressing and playing music like it. The music of The Outsiders, the early The Who, Stones, The Small Faces and U.S. garage rock bands. To be honest and I had that same feeling in the Patronaat in September, I ask myself, why, if you are as young as these guys are do you want to play music that is 50 years old today and not add anything to it? The songs are originals, at least as fas as I can tell, but the sound is an exact copy. That makes me having a hard time to get in the mood, as I left this music behind years ago and tried to look good on the dancefloor instead. I have made the effort though for this review. 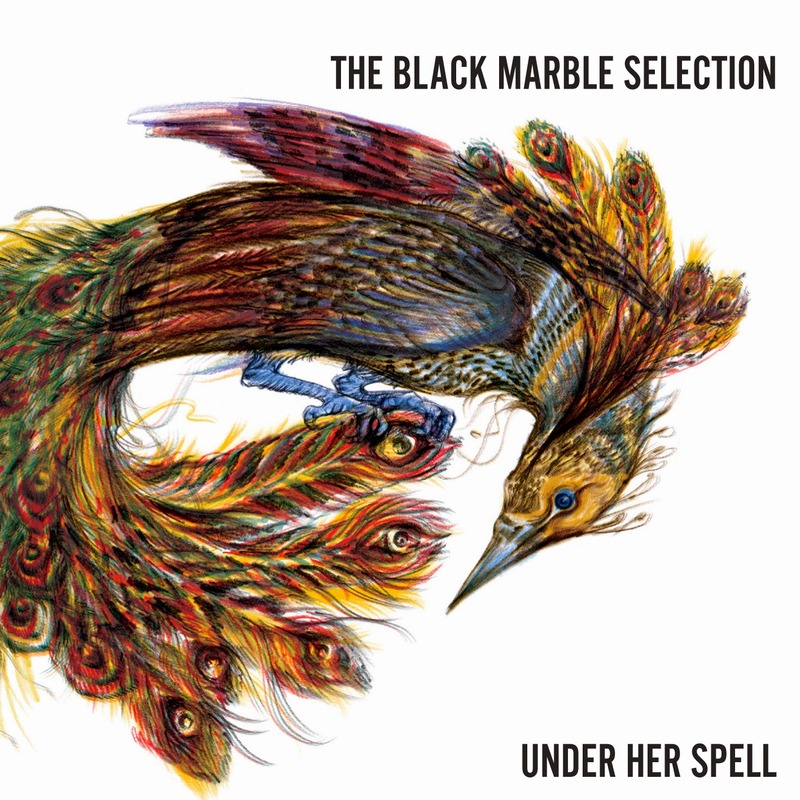 The Black Marble Selection is a band from Brabant, Tilburg to be precise. Started in the winter of 2012, by a bunch sixties music fans, the band started performing its own songs in the spring of 2012. This led to a first tv performance in 2014, the support tour for The Kik and an album deal. And a first album, Under her spell. These are the guys responsible for it all: Jean-Paul Lilipaly, lead vocal; Thijs Bus mouth harp; Jimmy de Kok, guitar, backing vocals; Erik Bus, guitar, backing vocals; Malenzie Mac-Donald bass guitar, percussion and Tom van Berkel drums. Together these lads recreate an era of long gone sounds and songs. From The Kinks to Jefferson Airplane, put the word "early" in front of all examples, you will find it on Under her spell. Yes, even the sitar, so the 1967 line is crossed in the instrumental 'Birds of paradise'. The band doesn't let itself be caught in just one corner. It takes the tempo down in 'Effortless progress'. Not unlike Q65 or The Pretty Things were capable of doing as well. A poppy melody disguised as a garage rocker. One of the songs that I actually really like on Under her spell, as it is just this more original. Something that caught my ear is the similarity in voices of Go Back to the Zoo's Cas Hieltjes and Jean-Paul Lilipaly's. Roughness, with these little hooks on the vocal chords that air is caught by on the way out. Some toughness, acting the leather jackets, hair combed back and ready to fight on a Friday night. There's an important thing missing though: the excitement. Everything this kind of music stirred up once has left and gone away. Not only has all been done before, the kids that went wild then have grown up and became grandparents if they lived to tell the 60s. That makes that an important factor that made this music special isn't here any more in 2015. Just onlooking middle aged types and even beyond. My scepticism has not been taken away by listening to Under her spell. That does not take anything away from the enthusiasm with which this album was made and the obvious love for this music the six musicians show. They can play and write a tune in a convincing way. The harmonica is biting and harsh. So for 2015 I give The Black Marble Selection the benefit of the doubt. After that some change, growth and less one dimensionality will be needed. For now, I'll admit it, fun. Je hebt van die platen waarbij het kwartje lange tijd maar niet wil vallen. Al maanden lees en hoor ik jubelverhalen over het debuut van The Gloaming, maar de plaat kon mij tot voor kort maar niet bekoren. Mooie ingetogen Ierse folk met verrassende invloeden, dat wel, maar het raakte me niet, waardoor de verveling uiteindelijk toe sloeg. Dat veranderde pas nadat de Nederlandse promotor van de plaat me de cd ook fysiek had opgestuurd en ik tijdens autoritten de tijd kon nemen voor deze plaat. Dat heeft het debuut van The Gloaming kennelijk nodig, want langzaam maar zeker heeft het debuut van The Gloaming me betoverd en veroverd. 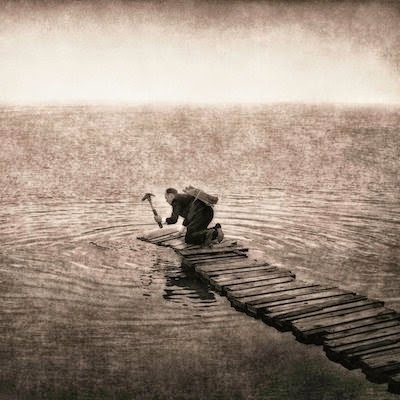 The Gloaming bestaat uit een aantal Amerikaanse en een aantal Ierse muzikanten, van wie de Amerikaan Thomas Bartlett, die als Doveman een aantal prachtige platen heeft gemaakt, voor mij de bekendste is. De Ierse muzikanten lijken in eerste instantie hun stempel te drukken op de muziek van The Gloaming. Dat ligt vooral aan de instrumentale intermezzo’s met strijkers en aan de in het Gaelic gezongen teksten. Het zijn precies deze twee ingrediënten van de muziek van The Gloaming die me in eerste instantie het meest in de weg zaten. De instrumentale intermezzo’s zaten op het eerste gehoor goed in elkaar maar hadden voor mij geen meerwaarde, terwijl de in een voor mij overstaanbare taal gezongen teksten de aandacht wegtrokken van de muziek. Inmiddels hoor ik wel de meerwaarde van de instrumentale intermezzo’s en draagt het gebruik van het Gaelic alleen maar bij aan de magie van de muziek van The Gloaming. The Gloaming maakt zoals gezegd muziek die is geworteld in de traditionele Ierse folk. Dat is muziek die ik slechts in zeer beperkte mate in de platenkast heb staan, waardoor ik erg moest wennen aan deze folk variant. De muziek van The Gloaming beperkt zich echter zeker niet tot de Ierse folk. 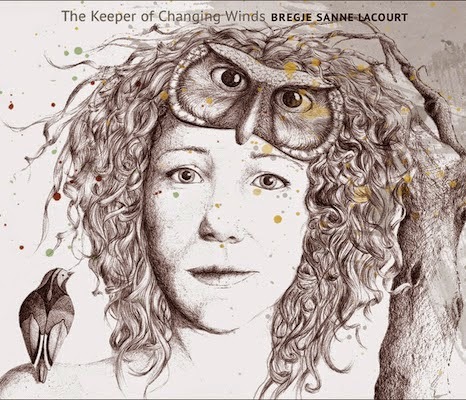 De Amerikaanse muzikanten van de band hebben hun bagage uit de Amerikaanse folk en de jazz meegenomen en krijgen alle ruimte om deze invloeden in te brengen in de muziek van The Gloaming. Deze muziek krijgt vorm in een aantal lange tot zeer lange tracks, die zich bijna zonder uitzondering zeer langzaam voortslepen. De muziek van The Gloaming moet het zeker niet hebben van snel effectbejag. In de meeste tracks wordt uiterst langzaam naar een climax toegewerkt. Dat is zeker in het begin even wennen, maar wanneer je de songs wat beter kent hoor je continu de onderhuidse spanning die de muziek van The Gloaming zo’n bijzondere lading geeft. Deze lading is samen met het muzikale vakmanschap dat van de plaat afdruipt voor een belangrijk deel verantwoordelijk voor de magische uitwerking die de muziek van The Gloaming uiteindelijk heeft. Het is muziek waarin meerdere werelden elkaar niet uitsluiten maar omarmen, met uniek klinkende muziek als resultaat. Liefhebbers van Ierse folk zullen waarschijnlijk makkelijker vallen voor de muziek van The Gloaming dan muziekliefhebbers die niet thuis zijn in dit genre, maar inmiddels weet ik uit eigen ervaring dat geduld loont. Als je het debuut van The Gloaming de tijd geeft om te groeien hoor je uiteindelijk muziek die een geheel eigen universum creëert. Het is een universum waarin stress, haast en geldingsdrang ontbreken, maar onder de oppervlakte gebeurt er van alles. Absoluut één van de meest bijzondere platen van de afgelopen tijd en misschien ook wel één van de mooiste. Het counterview met Jarig van Sinderen. “Hij gaat meerdere keren per week naar concerten en hij houdt van hardrock” ging het gerucht. Daar wilde ik natuurlijk meer van weten. Jarig ontvangt me tussen de bedrijven door en gaat gelijk, in hoog tempo, van start. Een drukbezet man. Chief Economist en directeur van het Economisch Bureau van ACM, hoogleraar Economie, auteur van enkele boeken en talloze artikelen. En dan nog wat nevenfuncties. Toch praat hij niet gejaagd. Rustig zelfs en gemoedelijk. Maar de informatiedichtheid is bijzonder hoog. WoNo Magazine kende hij tot voor kort nog niet. “Ja, dat kan kloppen, we zijn niet in heel brede kring bekend.” Ik vertel hem dat WoNo Magazine is begonnen als een afgewezen plan voor een muziekpagina in het personeelsblad van OPTA en dat Wo. en .No toen maar voor zichzelf zijn begonnen. En dat we inmiddels meer lezers buiten ACM hebben dan daarbinnen. De man van de cijfers vraagt “Hoeveel lezers?” Ik moet hem het antwoord schuldig blijven. We houden dat niet echt bij. Maar ik weet vrij zeker dat Jarig meer cd’s heeft dan WoNo Magazine lezers. Hij houdt van Prog-muziek. Progressieve Rock. Psychedelisch ook. Doorleefde muziek, bij voorkeur. Zijn favoriet is King Crimson. Daar heeft hij zo’n 200 cd’s van. Ik kan het haast niet geloven. Hebben die lui echt zoveel cd’s gemaakt? Met alle spin-offs erbij zal het misschien best kunnen. Want kijk maar eens op de WiKi-pagina van King Crimson. Hè, nu zit voor de rest van het gesprek ‘The court of the Crimson King’ in mijn hoofd. Alhoewel, het zal uiteindelijk worden verdrongen door iets anders. Ondertussen zit Jarig honderduit te praten. Wat een sympathieke gast is hij, trouwens. En wat weet hij veel! Hij vertelt over Robert Fripp (waar ken ik die naam toch van?) alsof hij er nog mee op school heeft gezeten. Hij verdiept zich niet alleen in de muziek, maar ook in de biografieën van de bandleden. Weet alle smakelijke details over consumptie van genotsmiddelen, strafblad en bedpartners. Dat soort zaken. Hij zou zo bij de Top 2000 kunnen solliciteren. En ondertussen toetst hij wat ik weet (niets) en of ik hem nog kan volgen (ja, dat wel, maar onthouden is dan weer een ander dingetje). Ik schrijf ijverig mee, maar kan thuis niet meer wijs uit mijn aantekeningen. Doet me aan de universiteit denken. Hij vraagt me van welke muziekgenres ik houd. En dan blijkt dat hij ook van Middeleeuwse muziek, Religieuze muziek en Barok houdt en er veel meer van weet dan ik. En dan: “wist je dat veel bekende Rocksterren van Middeleeuwse muziek houden?” Hij noemt een paar namen, waarvan ik Ritchie Blackmore (Deep Purple) heb onthouden. Dapper noem ik Sting, maar dat wordt genegeerd. Maakt kennelijk geen indruk. Hij vertelt dat hij ook wel eens naar het Festival Oude Muziek gaat. Alleen in Hedendaags (‘modern klassiek’, post-modern en neoklassiek) lijkt hij wat minder thuis. Van Ambient, Minimal en Soundscapes weet hij echter weer veel meer dan ik. En dan vertelt hij me dat Robert Fripp de Soudscape zo goed als uitgevonden heeft. Eindelijk valt bij mij het kwartje: daar kende ik die naam dus van! Hij heeft ook heel verschillende muziekgenres in huis, maar sommige cd’s draait hij heel weinig. Dat kan natuurlijk ook niet anders met die aantallen. De favorieten draait hij heel veel. “Als ik thuis ben heb ik de hele dag muziek aan. Ik vind het heerlijk om met muziek te werken. Bij ACM kan ik dat helaas niet maken” Op mijn vraag “waarom eigenlijk niet” komt geen duidelijk antwoord. Ik zie hem denken: “zou ik…?” Hij praat er overheen: “Ik ben opgegroeid in een groot gezin. Er was altijd lawaai en chaos. Met muziek kun je orde scheppen in de chaos.” Onwillekeurig moet ik weer aan mijn werkkamer thuis denken die toch echt het tegendeel bewijst. Ik laat het er maar bij zitten. Hoor ik hier toch iets van het spraakgebruik van een verslaafde? Zoals de Klisjeeman-netjes: “Rouk jêh?” “Nauw neuh. Nie meâh as drie pakkies puh dach! Dusseuh om nauw te seggâh dat ik rouk, nei!” Jarig, de muziekjunkie! Ach wat zou het? Er zijn ergere dingen! Heroïne, bijvoorbeeld. “Keith Richards zegt steeds dat hij optreedt om van de heroïne af te blijven. De ene verslaving tegen de andere”. “In de jaren ’70 waren de musici nog echte idolen met eigen vliegtuigen en voetbalteams. Ze waren onbereikbaar. Nu is het veel moeilijker er geld mee te verdienen.” (Dat kan de directeur van WoNo Productions inderdaad beamen.) “Ze zijn nu meer ‘down to earth’ en veel toegankelijker. Ik heb laatst een keer met Mick Fleetwood staan praten. Leuke vent. Robert Fripp daarentegen is nog steeds moeilijk benaderbaar. “Aanstaande zaterdag ga ik naar Focus”, laat hij zich ontvallen. “en binnenkort naar The Who.” Dat is het moment waarop ik als redacteur van WoNo Magazine gewacht heb. Soepel als een panter sla ik toe en enkele seconden later hoort Jarig zichzelf toezeggen een stukje voor WoNo Magazine te schrijven. De kamer zindert nog even na. Ik wrijf in mijn handen. Maar Jarig herstelt snel. “Al die oude bands die nog optreden en platen maken, dat is toch schitterend!. Alhoewel je je wel kunt afvragen of dat nog dezelfde bands zijn. The Small Faces, bijvoorbeeld: allemaal dood, op de drummer na. Kenny Jones. Ik heb een gelimiteerde box van The Small Faces, met o.a. de handtekening van de vorig jaar overleden Ian McLagen. Een collectors item”. En dan komt hij toch weer op King Crimson. Indirect dan, via de afscheidstournee eind februari 2015 van UK, ook een spin-off van King Crimson. Daar gaat hij ook naar toe. En dan zit dus voor de rest van de dag Rendez-vous 602 in mijn hoofd. Ach er zijn ergere dingen. Een counterview is een interview waarbij de geïnterviewde meer vragen stelt dan de interviewer. Yes, thank you, Erwin Zijleman. A real gem was tipped on his own website 'Krenten uit de pop' (http://dekrentenuitdepop.blogspot.nl/). Wo. started listening and was sold first time around. Yesterday WoNo Magazine re-published Erwin's post (http://wonomagazine.blogspot.nl/2015/02/heat-death-of-universe-bunnies-on-ponies.html), today it's Wo's turn. Heat death of the universe kicks of with the fun guitar eruption called 'Castle Van Halen'. Something that brings Dinosaur Jr. to mind, a more poppy version, but loud enough variation of that band. The light is let through the texture of the song, thus creating a best of both worlds kind of song. Eddy and Alex may or may not be living in a castle these days, this castle rawks out. The amplifiers up to eleven and see what happens when a note is let loose just this little too loose. Add another effect pedal and the whole thing explodes, while still colouring between the lines, if only so barely that the Kindergarden teacher may just not notice. This indie rocker has nothing to do with the hardrock moloch of old. Bunnies on Ponies is a band that Samuel F. Scott does on the side of his other band. 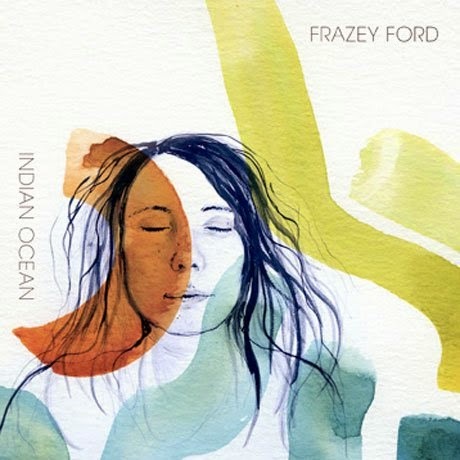 Together with Tom Callwood on bass guitar, backing vocals and Craig Terris on drums, percussive instruments and backing vocals he created this wonder of indie rock (songs) that jumps in all sorts of directions a long as there is a huge element of fun mixed into the songs. His first and main (?) band, for certain first band is The Phoenix Fondation. Next to that Scott released two solo albums to date. Since 2004 he's active with Bunnies on Ponies in order to record songs that do not fit The Phoenix Foundation. Heat death of the universe is the band's third to date. 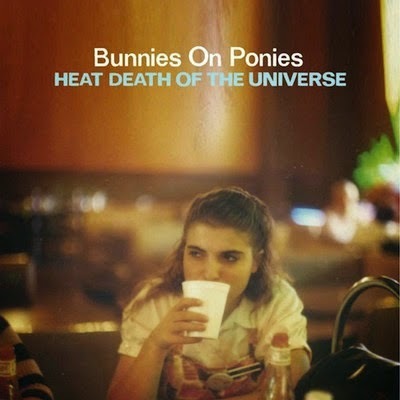 Heat death of the universe is not exactly a one trick pony. A lot of the songs sound very different to each other. Let's take 'Destination Newton Park flats' as an example. The Clash in its 'Sandinista' days. No punk left insight except for the attitude. Loads of echo on the voice, sung as if permanently high, a rhythm that sets the song apart as does the whole atmosphere, including the free jazzing saxophone. A weird but great track. 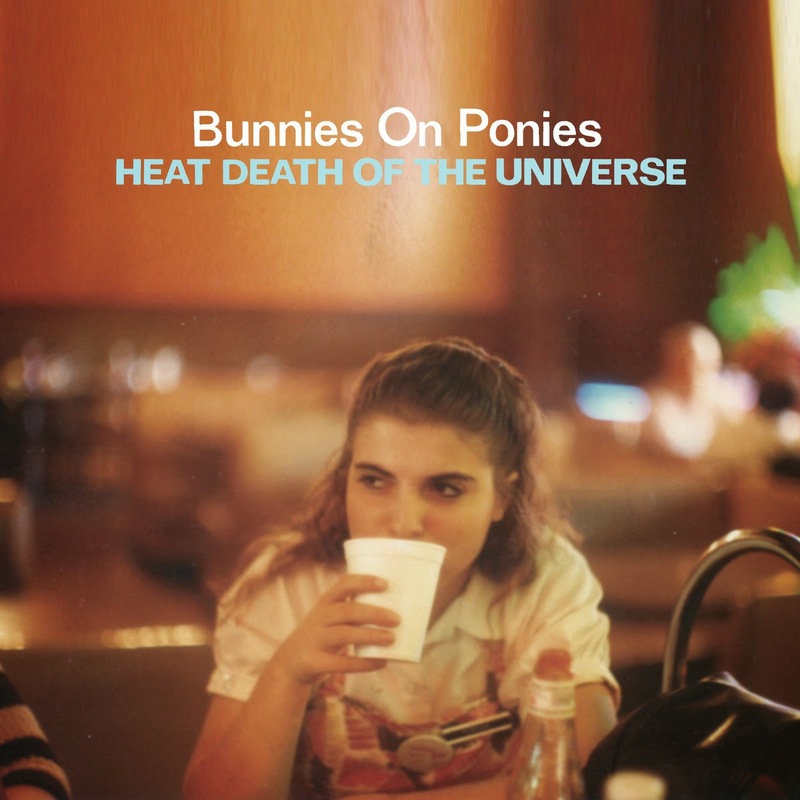 Sixties garage rock is a genre Bunnies on Ponies are quite familiar with also. Loud guitars and drums, but never forgetting a good singing melody. Just pay attention and the oohs and aahs pop up in corners of the mix, as do full harmonies here and there. Adding to the fun and atmosphere of the record. 'Baked' has this loud drum part, with hard pounding and muting of a cymbal, filling the whole song on its own, nothing subtle about it. That is all in the vocals. Halfway through I'm wondering whether Heat death of the universe is the indie rock version of The Beatles celebration called 'Catch-all' the band Swag produced circa 10 years ago. Heat death ... is less one dimensional, but still. Bunnies on Ponies celebrates a kind of music, honouring it, but also adding, just like Swag did. And having just as much fun. When the band plays with the reckless speed off, like in 'Only thing', the ballad Bunnies on Ponies style convinces easily. The relaxed intro with some delay on the guitar. the change when the rhythm section kicks in. Slowly some madness creeps in, a little Radiohead. Or in 'Spectrum where the acoustic guitar allows the bass to come forward, that is plopping away gently, adding a convincing part to the song, while slowly other fun parts are added ending all in a loud guitar solo bringing 70s powerpop bands to mind. The moodswings add to the different flavours on the album. Something for everyone or so it seems, but unfortunately for Bunnies on Ponies things are not that simple. From Wilco, minus Nels Cline to The Romantics, fans will find something to their taste and a lot more. Heat death of the universe is a rich album, made for the love of this kind of music. Deze recensie start ergens in het najaar van 2014. In Salon de Baronie, de koffiezaak ++ die vriend en zanger Frank van de band die bij gebrek aan de noodzaak voor een pakkende naam nog steeds schertsend met de naam De Band Zonder Naam In Oprichting, BZNIO in het kort, door het bestaan gaat, vorig jaar opende in Alphen aan den Rijn. De band die al enige tijd niet veel had gedaan wegens al het werk dat in een nieuwe zaak gaat zitten. De bandleden zaten aan tafel om te bespreken of er nog een toekomst was voor BZNIO. Die bleek er te zijn, sterker nog, er zijn twee nieuwe leden. Wij zaten aan de thee of koffie, gebakje erbij aan de lange, enorm stevige stamtafel van zijn zaak op een vroege vrijdagochtend. Ik keek mijn ogen uit in de fraaie zaak. Het hoge plafond, de open ruimte waarin de buizen lopen zoals in de oude fabrieksruimte die het pand ooit was. De enorme, grote ramen, die de zaak nog veel groter lijken te maken dan hij al is en de aankleding waar iedereen zijn plekje kan vinden om bij te kletsen, de krant te lezen of gewoon van de koffie te genieten. Een plek die juist door die ruimte warmte uitstraalt. Een plek die je als Alphenaar op je netvlies moet krijgen. Op een gegeven moment zei Frank: "Moet je dit eens horen. Dit meisje heeft hier pas geleden nog opgetreden". Hij zette een cd op, flink hard en dat maakte wel indruk. We hebben onze eigen Birdy dacht ik meteen. Meisje met gitaar, die zacht zingt. Daarna gingen we over te de orde van de dag. Hoe gaan we verder? Robin Haijes bleef echter wel in mijn hoofd zitten. 'In the meantime' had wel indruk op me gemaakt. Het nummer staat op een EP met zes, eigenlijk vijf liedjes. Twee opgenomen in de studio, als prijs voor het winnen van de "Singer/songwriter Award" van de Stichting Serious Music Alphen in 2014. De cd is verder gevuld met vier live opgenomen nummers tijdens de finaleavond. Het prijswinnende optreden dus. De live zijde laat horen dat Robin Haijes meerdere kanten heeft, waarin zij een stevigere kant van zichzelf laat horen. Zij begeleidt zichzelf op gitaar of piano. Dit maakt de liedjes kaal en elementair, maar maakt mij ronduit benieuwd hoe zij zal klinken in een band omgeving, waarin haar liedjes de aankleding krijgen die zij, ook, verdienen. Haar aanpak van schrijven en zingen doet mij aan Mieke van Veen denken. Dat maakt dat haar nummers nog enorm kunnen groeien, terwijl zij al een goede indruk achter laten in hun elementaire versie. In de twee studio opnames zijn daarvan al een eerste aanzet te horen. Het titelnummer is grotendeels Robin Haijes en haar gitaar, maar kent een tweede stem en accenten op een elektrische gitaar. 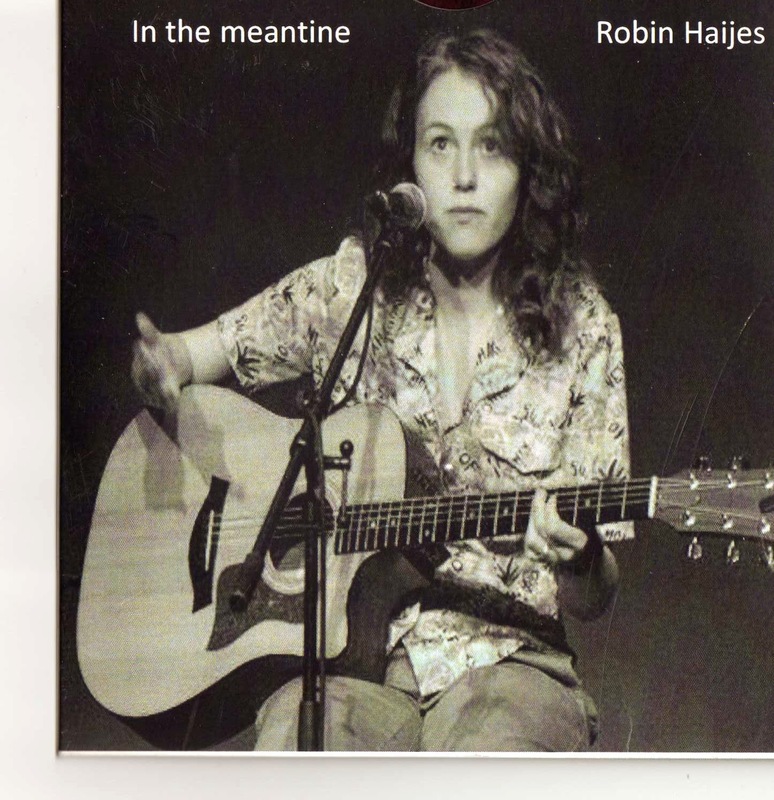 De overdubs onderstrepen de sterke punten van 'In the meantime'. Zij slaagt er in een paar goede veranderingen van sfeer en tempo in te passen, die compleet organisch klinken. 'In the meantime' is een sterke basis voor iets wat een geweldig goed nummer kan worden. Datzelfde geldt voor 'Noose', het tweede studio nummer. Een ballad waarin Haijes zichzelf opnieuw op de gitaar begeleidt. Haar tweede stem verweeft zich opnieuw op prettige wijze. De elektrische gitaar speelt spaarzame, licht vervormde noten in het instrumentale tussenstuk, waarna de sfeer weer teruggaat naar zacht en gesloten gordijnen in de winter. Robin Haijes heeft een ijle stem, die van een meisje. Gezien het feit dat zij 17 of 18 was ten tijde van de opnames, is dat niet verrassend. Het is wel een warme stem, waar ik graag naar luister, heb ik al gemerkt. Veel verrassender is de kwaliteit van haar nummers. Natuurlijk kan later blijken dat dit haar hoogtepunt was, maar op basis van wat ik op In the meantime heb gehoord, zou ik zeggen: talent. Inschrijven voor Giel Beelen en kijken hoever je kunt komen. Uit haar Facebookpagina blijkt dat er nieuwe opnames in de maak zijn. Kortom, dit wordt vervolgd. En Salon de Baronie? Dat is een prima zaak, waar je kunt genieten van koffie, thee, gebak, ijs en meer maar bovenal sfeer. Bovendien treden er met zekere regelmaat lokale helden op. Een reden te meer om de zaak in de gaten houden. Wie weet, tref je ondergetekende nog eens aan daar met een gitaar in de hand.